Rent villas and apartments in Vico Equense, Italy with private pools. Book affordable holiday rentals that are near a beach. VILLA ROMEO is a welcoming two-storey villa for 10 people which has been completely restored. 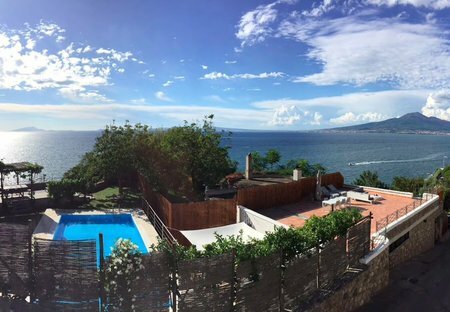 From Villa Romeo you’ll enjoy a grand view of the Gulf of Naples, Vesuvius, and the sea. VILLA ARORA is a spacious 95 square meters one story home with stunning views of the ocean. It has 3 bathrooms and 3 bedrooms. Cosy tastefully furnished bungalow in a tourist complex directly by the sea with shared swimming pool and outdoor area. The holiday village extends over an area with different levels. Bright one bedroom apartment for up to four people with sea view, solarium, hot tub, garden, air - conditioning, Wi-Fi, satellite TV on Sorrento Coast. Newly refurbished 1 bedroom apartment for up to 2 people with air-conditioning, wi-fi, satellite TV, garden, solarium, hot tub and sea view of the Gulf of Naples. Looking out over the spectacular Bay of Naples from its lush hillside setting. Newly refurbished 2 bedroom apartment, Vico Equense on the Sorrento Coast, sleeps up to 4 people. Casa Micla is a newly refurbished apartment located in the centre of Vico Equense. It is 70 metres squared and can sleep up to 5 people in 2 bedrooms and features air conditioning and WIFI internet. This is a splendid two-story villa located on a hillside, facing the sea. It sleeps up to 14 people. From the villa, you will enjoy a breathtaking view of the sea in the distance, of Sorrento Coast. This 3 bedroom villa is located in Vico Equense and sleeps 4 people. It has WiFi, barbeque facilities and parking nearby.